There are at least two methods of making existing bathroom vanity cabinets taller. In order to raise the cabinets higher you will need a few basic tools and some low cost materials. Perhaps, extending the plumbing will be the biggest challenge. I will give you instructions for one of the two ways of lifting the cabinets up more. This method is the lessor expensive choice of the two. 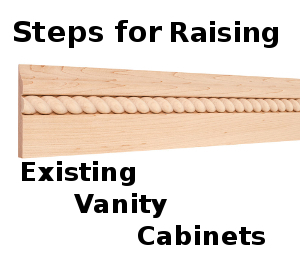 It is actually a low-budget cabinet remodeling way to raise the vanity area. There are a few things that must be considered prior to making a decision to lift the cupboards up a few more inches. This list will get you started. If there is going to be interference with any one of these things, this will eat into your time and budget. Consider the cost of the additional things that must be done prior to starting the project. Electricians and plumbers can get to be expensive if they are needed. Tip: Make sure the water shut-offs work properly to the sink. If they do not, you will need to have them replaced. It’s going to be necessary to remove the countertop in order to make the existing bathroom vanity cabinet higher. The screw lengths will be determined by how high you will be raising the cupboards. When you are attaching the pine to the cabinets to make them higher, you will need to be creative. On the back-wall you may just need to add some adhesive caulk to the riser and glue it to the back-wall because the existing cabinets my not have anything to screw it to. For the sides of the cabinets, it may be necessary to add additional support pieces for the risers to be attach to. Disconnect the plumbing after you are sure the water shutoff valves are working properly. Cut all caulking lines around the countertop. Take the vanity cabinet doors off and drawers out. Remove the countertop with an electric drill if it is screwed into place or gently tap a putty knife between the cabinet and counter to separate the two. Once the cabinet counter is removed, cut the 1×4 Pine to the height that you want to lift the bathroom to. If you need corner blocks to attach the counertop to now is the time to install them. Pre-drill pilot holes and screw the pine to the top of the cabinets to make them higher. Prime your decorative molding and then cut it to the proper size. Adhere the new molding pieces to the pine using finish nails and a nail set. It would be a good idea to pre-drill small hole in the molding prior to nailing it into the pine riser. Make sure that the new molding is not going to interfere with the operation of the doors or drawers in any way. Fill the nail holes, finish painting the molding and re-install the countertop. Install and adjust the cabinet doors and adjust the drawer fronts. Your final step is to get the sink hooked up. This is obviously going to require some new parts because you just raised the cabinets and the old fittings are now too short. Making a bathroom cabinet higher in this way can be very attractive. The decorative molding adds a real rich appearance to the cupboards. The other method of making existing cabinets higher involves making the cabinet toe kick plates higher. When that method is used some of the plumbing has to be redone and the cabinet back does too. If I were you, I would stick to the method I just explained on how to make bathroom vanity cabinets higher. It is the easiest of the two, the least expensive and will add a high-in look to your bathroom.